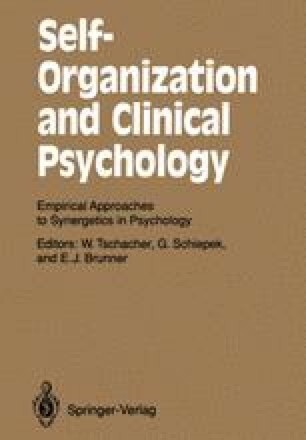 The transfusion of basic principles of self-organization theory to cognitive processes is a necessary and promising task of general and applied psychology. For historical reasons and because of practical evidence self-organization concepts have already gained considerable acceptance in psychotherapy. But the attempt to link the basic theoretical principles with cognitive phenomena and with concrete therapeutic interventions is still in its infancy. The interventions often seem to be more a product of the therapists intuition than a consistent deduction, and in experimental psychology only few examples of phenomena analysed in terms of self-organization theory can be mentioned. In self-organization theory the dimension of stability and instability of system behavior is of central importance. Systemic instability is a critical agent of order formation. In the phase of instability the system becomes sensitive to minute influences in the sense of little cause having great effect. For psychological processes it can be hypothesized that any cognitive organization or reorganization is guided by phases of internal instability and that the impact of external fluctuations varies with the degree of this instability. As a concrete example, a close connection between suggestibility and cognitive instability can be postulated. In this report experiments are described to prove these assumptions and some theoretical and practical consequences of the empirical results are discussed. The idea of a synergetic approach to psychotherapy is outlined. The special therapeutic relevance of hypnosis and ritual behavior is briefly explained.